Today we received our hot water heater. We decided on the PrecisionTemp RV-500 instant hot, tankless, hot water heater available through Precision Temp. They offer this water heater at a great price. 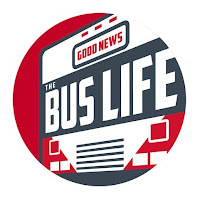 Also mention the "Good News Bus" when buying the RV-500 hot water heater and get a discount. The RV-500 is a little bit more expensive that the other RV water heaters on the market but the the features outweigh the price. For example, this water heater will heat 900 gallons of water on one standard size propane tank. Check them out and remember to mention us. efficiently and conveniently with up to 55,000 BTU’s of power. At a flow of 1.5 gpm it can provide shower temperature water with incoming temperatures as low as 40 degrees. A 20 pound tank of propane (a barbeque-type tank) will provide approximately 940 gallons of shower temperature water. The RV-500 is quiet and efficient. For the same amount of propane the RV-500 produces 15% to 20% more hot water. And because you are not constantly reheating a tank, many people find that they use 50% less propane. Whatever the incoming water temperature, the patented gas modulation of the RV-500 gives you consistent water temperature. Water as hot as you it for as long as you want. I told the people at Precision Temp about our project and they said if any of our readers wanted to order the RV-500 to mention that you saw this post on the Good New Bus blog for a discount! We will be installing the RV-500 soon so check back for updates!